Last edited by CarrolltonBassmaster; 08/08/18 12:03 AM. "Goats are for Muslim barbeque. Is there some ethnic or religious that eats Llama?" Thanks. You saved a lot of people $ and aggravation. "What are you trying to catch with that bait, a shark?" Actually the stated fact that you needed to own "6 Gen 1 Pond Prowlers in the last 10 years" makes me think they were not actually too heavy duty! Last edited by 361V; 08/08/18 12:01 PM. I do not tell may ppl this for the fact that it's fairly unbelievable to most fisherman, However, I fish 300 days a year. I have 17 local fishing ponds within a 25 mile radius from me and everyday after work my dad and I go fishing. The Pond Prowler Gen 1 got years of "Normal" use in 9-12 months of daily use by me. 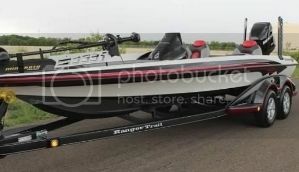 The ponds have rock and gravel, Cement boat ramps, and I use a winch to drag it up hills and onto a trailer with 300 lbs of gear in it so in the full spectrum the Pond Prowler 1's were extremely durable. I used to have one of the original Pond Prowlers. The best pond boat I ever owned was the Bass Hunter "Bass Baby" Boat. I had one before Bass Hunter bought them out. Heavy duty material with wheels on bottom of the boat for easy moving around. No comparison to the thin lightweight plastic of some boats. A friend of mine has had one for 15 years and it is still in great condition. Have owned and fish very frequently in it for about 8 years or so. Still performs like new, incredibly durable.